Since the first MOOC was launched at the University of Manitoba in 2008, this new form of the massification of higher education has been a rollercoaster ride for the university sector. The New York Times famously declared 2012 to be the year of the MOOC. However, by 2014, the number of academic leaders who believed the model was unsustainable doubled to more than 50%. While the MOOC hype has somewhat subsided, the attitudes and anxieties of this peak time can still be seen influencing universities and their administrations. 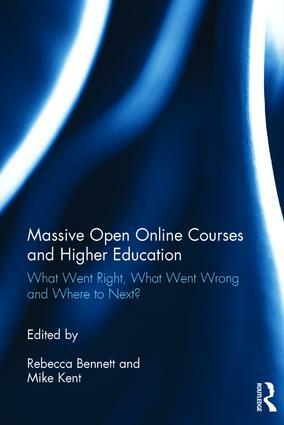 This is the first volume that addresses Massive Open Online Courses from a post-MOOC perspective. We move beyond the initial hype and revolutionary promises of the peak-MOOC period and take a sober look at what endures in an area that is still rapidly growing, albeit without the headlines. This book explores the future of the MOOC in higher education by examining what went right, what went wrong and where to next for the massification of higher education and online learning and teaching. The chapters in this collection address these questions from a wide variety of different backgrounds, methodologies and regional perspectives. They explore learner experiences, the move towards course for credit, innovative design, transformations and implications of the MOOC in turn. This book is valuable reading for students and academics interested in education, eLearning, globalisation and information services. Part 3 – Where to next? Rebecca Bennett is the Academic Support Programs Coordinator in the Kulbardi Aboriginal Centre at Murdoch University, Australia. She is a cross-disciplinary academic whose research and teaching interests include Cultural Studies and the Scholarship of Teaching and Learning. She has authored journal articles on critical tourism, digital pedagogy, academic identity, cross-cultural communication and queer/international student intersections. Mike Kent is a senior lecturer and Head of Department of Internet Studies at Curtin University, Western Australia. Mike's research focus is on higher education, particularly online education, as well as online social networking platforms. His other area of interest is in people with disabilities and their use of, and access to, information technology and the internet.